Anti-ISDS protesters in Brussels. Photo used with permission of author.ISDS. Many might not know what the acronym stands for, but many more have heard of it at least once. Quite an achievement, since ISDS is not only an element of unsexy investment and trade policy, but also something that TTIP negotiators have tried hard to bury under a mist of secrecy. ISDS stands for Investor – State Dispute Settlement. Behind the name there is a mechanism to resolve disagreements between the governments of countries bound by Treaties of Investment Protection on the one hand, and international, private investors and corporations on the other. Those who propose ISDS to be part of Treaties of Investment Protection argue that in order for European countries to be attractive to foreign investment, states should accept they can be brought to court by unelected, profiteering companies if these consider public laws put them at disadvantage in their profiteering endeavors. It doesn't take much to realise how this would make it much easier for businesses to challenge public decisions – which is particularly bad news when it refers to good pieces of law. It is a reality that Germany has been sued through an ISDS court for deciding to stop using nuclear energy and Cyprus for not rescuing an irresponsible banks. In case the erosion to democracy ISDS entails is not threatening enough, there's also the issue of public money channeled towards 'compensating' investors and corporations when they win the trial. €30 billion is the amount claimed from European taxpayers alone through ISDS courts. €3.5 billion of which have already been cashed in, with the rest being still unclear as the cases are yet to be concluded. There's a lot more that is wrong about ISDS, and the Seattle to Brussels Network explains it so much better. We have thousands of grassroots groups, trade unions, NGOs, journalists and all sort of advocacy groups across Europe to congratulate and thank for this. Why congratulate? Because it’s rare for 3 million Europeans to come together and pronounce themselves on investment and trade policy, with a single voice. It is even less common to see nearly 150,000 Europeans fill in a European Commission consultation and elaborate opinions on investment protection policies. All of them stood against ISDS. Why thank? Because indeed those millions are right. ISDS is worth fearing - if you stand on the side of democracy and wealth for all. And European civil society, in a joint transnational effort, has brought this threat to life and shown its real face. The transnational movement that has achieved it has done so well that the institution behind this proposal - the European Commission on behalf of the governments of the EU member states - has recently pulled a rhetorical stunt announcing that ISDS is dead. And that Europeans should welcome ICS instead. At WeMove.EU we've called this trick 'The Great Rebranding'. Trade policy experts from across Europe have said it: we won't be fooled by a name change. The core problem with this ICS proposal is that it still contains the idea of a judiciary system that is parallel to our public courts system, and that is only available to some people: foreign investors and businesses. The Investment Court System (ICS) proposal is not substantially different to ISDS and the changes introduced to the latter are minor - especially if compared to the threat that the very system of courts for investors poses to challenge democratic decisions. One of these tweaks revolves around transparency, which the Commission argues has been increased by virtue of allowing third parties to attend trials in ISDS courts. Another 'reform' would require ISDS private lawyers to have qualified as judges. However, this prospect is of little relief because we know such ‘judges’ will still be acting as private lawyers in the ICS system and that the more cases they arbitrate, the more money they will earn. Since this type of legal action can only be initiated by corporations, not by governments, there is a strong incentive for judges to rule in favour of corporations. The new ICS proposal does obviously not address the concerns of European civil society. This maneuver means the transnational movement against TTIP will step up to show how ICS amounts to little more than rhetoric. In fact, there are more challenges the Stop TTIP movement has, and is ready, to face. ISDS is part of the Transatlantic Trade and Investment Partnership (TTIP) currently under negotiation between the US and the European Union. And while it'd be great news to stop TTIP and in that way rid Europeans of numerous unwanted wrongs (including ISDS courts), there are other, existing and potential, treaties that also contain ISDS provisions. As Gus Fagan reported recently, “CETA (the equivalent to TTIP but between the EU and Canada) contains all those features which campaigners find objectionable in TTIP” - that includes ISDS. Considering CETA negotiations are way more advanced that TTIP's we would do well to build on the awareness raised so far around ISDS in TTIP and explain to Europeans that our resistance is more generally against systems of investment protection of this sort. Currently the EU is party to numerous trade and investment protection treaties, many of which contain ISDS provisions. Good news is that the scope of ISDS in those treaties is limited when compared to the power and privilege investors and corporations would gain if TTIP or CETA were signed. After European Trade Commissioner Cecilia Malmström's announcement on September 16 that ISDS was becoming ICS, EU governments started looking into this so-called reform. 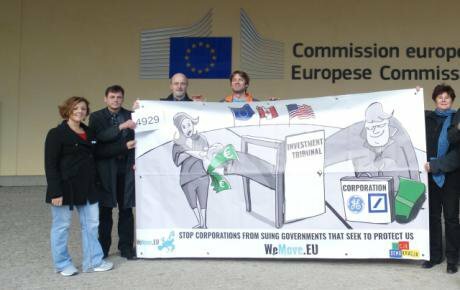 This is the moment WeMove.EU chose as the initial point of a campaign to further build resistance against special courts that allow corporations to sue governments, whether these are called ISDS or ICS. This happened only a week ago, coinciding with the beginning of the International Week of Mobilisations against TTIP (with dozens of demonstrations across Europe, including a 250,000 strong march in Berlin). In just a week a new organisation known to few (yet) has gathered the support of 5,000 against ISDS within just a few days – and that is without having fully launched the petition, as other languages are still to be introduced. And we promise this is just the beginning, the declaration of intent before a full-blown battle that will feature educational, media, lobbying and direct action efforts to ensure as many Europeans as possible know what ISDS means for their rights and stand firmly against it. Profiting from Injustice: How law firms, arbitrators and financiers are fuelling an investment arbitration boom. International Days of Action, for Democracy, Social Justice and our public services!